GIF image animation. If you zoom in, wait a while, first 'loop' works slowly. Unfortunately it looks like nothing more will be made. At least for the moment. Fëanorians are not the only unsatisfied side of the conflict. Most of the nobilities of the House of Finwë are protesting the title of the first episode. In their opinion, a "Nightfall in the Hearts of Noldor" title suggests that the Noldor were the only group to blame in the history of The War of the Jewels. 'And what about Morgoth!?' they ask. Exactly - what about the dark Vala? Here comes the answer. 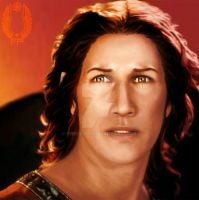 According to the words of his spokesman, 'Lord Melkor is really disappointed with the diminution of his part in the story and the omission of the whole "Ainulindalë", where his voice sounded by far the most beautiful.' It looks like Morgoth has forgotten that "Ainulindalë" is not a part of the "Quenta Silmarillion". The director's team decided to postpone the premiere, previously planned for summer 2709. With invaluable help of Sirielle, they plan to show the movie December 3756. The words visible in the image are beginning of The Oath of the Fëanorians, you'll find full text here [link] , with it's Quenya and modern English translation. Tengwar script frame at the image is Quenya version of the oath. The animation is nice, but the 'article' you added is great. I didn't realize it's from 2005, lol. "don't fear the eyes of the dark lord"
old 'nd dull, yet clear like crystal suddenly"
The poem is beautiful, thank you for such great comparison I didn't know this poem, need to find the whole version. Oh, well, the full poem is here: Rainer Maria Rilke - Der Knabe. Well, it's in German though, and I am not sure if someone competent tried to translate it... I could try to translate it fully if I am in the mood (it's like doing a quiz for me), but it could be far from competent. in the winds of their wild stride. through which we race as in a dream. the hooves of horses rattling like a rain. I just noticed I've never answered your last comment - or maybe I did somewhere else? It was like 10 years ago!? I'm sorry! This poem is so beautiful and fits the Silmarillion's mood perfectly. Thank you so much for the translation! Na moje oko poprawnie zrobiona animacja W ogole sam obrazek mi sie podoba. Ladny efekt blyskawicy. I like the image but I don't get the meaning.. ?!? You explained well, it was me not knowing the story. If it's in the Silmarillion, I began reading it but stopped shortly after. Yes, it's from the 'Silmarillion'. Exactly - 'Quenta SIlmarillion' - I think 'The flight of Noldor' chapter. 'Silmarillion' is quite hard to read at the first time - lot of names and places, heroes come and go... You need to read fast the beginning and don't give up or... Just start with QS, but then you missing some mythological background to the world. No no, piękny efekt. Naprawdę robi spore wrażenie. Twisted? To dobrze czy zle? Very, very well done animation! The lightning shots in particular were REALLY neat!! And the drawing is SO pretty!! Once again, really beautifully done, and extremely atmospheric. I love how the Star of Feanor emblem is a lot more luminous than the rest, sort of mirroring the West Gate of Moria. He looks extremely fearsome and strong, and I can only imagine the fear that the Orcs must have felt when thousands more of the Noldo marched east and northward. Great stuff! Jak w koncu rusze podrecznik do Flesha - kupilam juz z pol roku temu, to cos ciekawego z tego wyjdzie. Jak juz wladowalam upgrade, to mialam wizje jakby to mozna bylo doprawic - jeszcze wiecej czerwieni i krew na zbroje... W 1 mignieciu. Tylko nie potrafie tego na razie namalowac. Prosta rzecz - z bazowego Noldora z pomoca narzedzi 'jasnosci/kontrastu' zrobilam noc i rozjasniony blysk. Domalowalam powieki na osobnej warstwie (wszystko jest na osobnych warstwach). Pozniej zrobilam wersje czerwone - 'balansem kolorow' dodalam czerwieni w polcieniach i cieniach, pedzlami reszte, ale 'pedzlem historii' przywrocilam prawie w calosci kolory na twarzy. Srodek animacji jest bardziej czerwony jak sie przyjrzysz. no czyli bawilas sie... ok no moze nie krzywmi, ale jednak opcjami kolorow tak czy siak fajny efekt. Krzywe to bardziej zakrecone narzedzie, jasnosc i kontrast sa proste jak but, nawey MS Word to ma wbudowane. Wiekszosc zmian i tak pochodzi spod pedzla, balans kolorow to jakies 5% efektu. hmm the flash is now a little too bright. I liked it before with the sudden flash. It works faster offline. Perhaps I need to reduce the amount of used colours, then it should flash faster. And I changed the 'lightning' images - present one has got red background, maybe too bright. Now I need to work on it more. Thank you for your opinion! Yeh the red is whats throwing it. Lightning in my opinion should flash blue. I wanted to put there 'fire and blood', but it's not the result I wanted... All must be in reds or no reds at all.